Our tool completes the code for you, checks your syntax while typing and helps you format and beautify the code consistently so you can focus on the creative aspect of hardware design. With this add-on, all it takes is one push of a button and you will generate complete state machine diagrams or block diagrams. Our Premium Documentation Generator creates a PDF with all the relevant information from your project. Information will not be duplicated, so it is always consistent. Documentation is kept up-to-date. Sigasi Studio guides you through complex code designs. With instant feedback on errors and auto-completion suggestions. 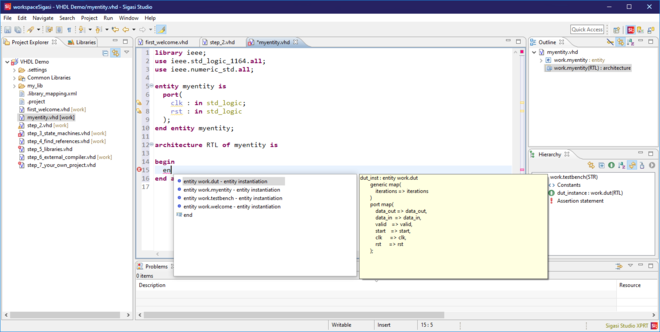 Reducing development time and helping you and your team write better VHDL and SystemVerilog code. 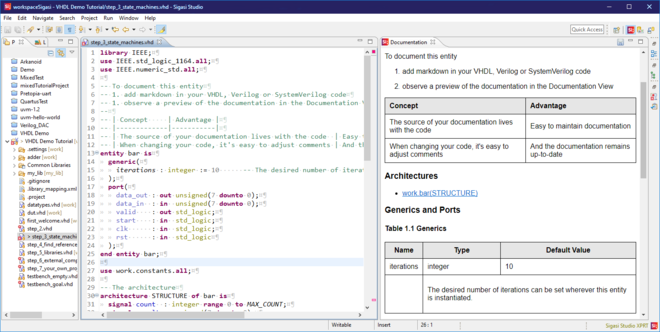 A basic text editor just won’t do if you want to write VHDL or SystemVerilog code like a pro. Sigasi Studio is an intelligent design tool that offers advanced design assistance. Why walk if you can drive… or get driven to your destination? Our secret ingredient is the super fast built-in compiler. Because Sigasi Studio understands your code while you type, it can help you be more productive, produce higher quality work and have fun in the process. WATCH OUR ONE MINUTE VIDEO AND CONVINCE YOURSELF NOW! Sigasi Studio understands your project while you’re creating it! Code completion, based on where you are in the code including component instantiation. Sigasi Studio marks your syntax errors as you type so you can fix them right away. The code is formatted and beautified consistently. 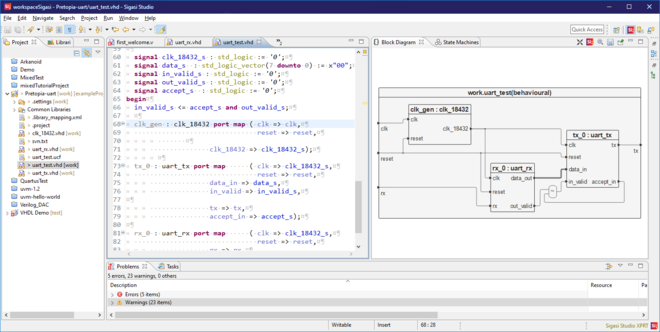 Sigasi Studio serves as a VHDL and SystemVerilog code browser, so that you can navigate through your designs to understand large and complex legacy designs. With graphical browsing you can create visuals of your code, updated instantly and cross-linked to your code. See errors while you type and get warnings about dubious code. Save time and money as you need less time to write better VHDL and SystemVerilog code and you are able to free up valuable time at code reviews. Sigasi Studio knows how to handle your projects without configuration. Or you can choose to create a custom workbench, tailored to your needs. Built on the Eclipse framework, available both as Eclipse plugin and as a standalone application. You are free to choose your own project structure, install other Eclipse plugins, use any language, version control- or issue tracking system. Stop the endless cycle of coding and checking with Sigasi Studio’s most unique feature. Type-time linting checks your code while you are typing it. If the manual or the tricks available on the Insights-section of our site are not enough for you and your team, there are several ways in which we can help you train. Ask us! Sigasi believes in education and provides Sigasi Studio for free to hundreds of universities worldwide as teaching and learning tool by thousands of students and professors. Sigasi Studio analyzes your code as you type, our “Content Assist” feature is fully aware of the context and offers you only the relevant templates. Sigasi Studio’s built-in compiler knows the meaning of each word in your code, even if it’s declared in a different file. This works for all objects in your design. Save time by typing less. Keep your code clean and well formatted. Our templates only show up where they are legal. more time coding instead of typing. Sigasi makes writing VHDL code real fun. And the support is very, very fast.